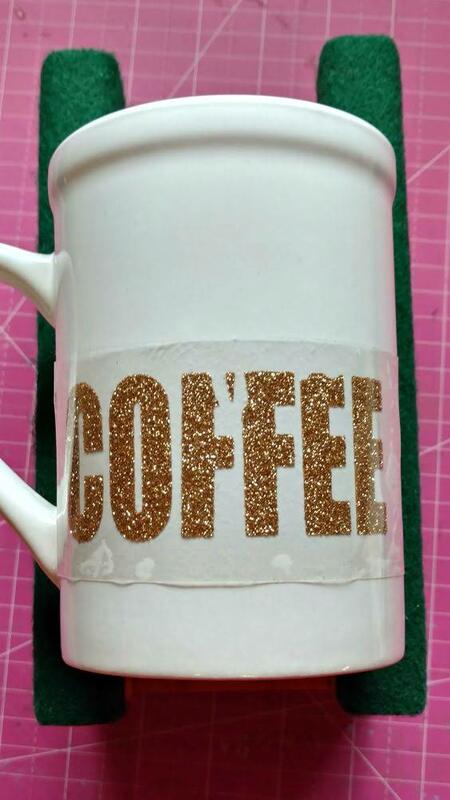 Did you know that Glitter Heat Transfer Vinyl can be cut with Silhouette CAMEO and then applied to ceramic to make dishwasher safe mugs?! It's true...and it's amazing! So you know from our past experiments (remember when we tested it out on glass?) that Heat Transfer Vinyl isn't just for fabrics anymore. 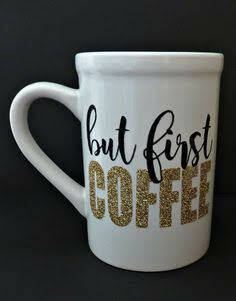 Little did most of us know that it would soon be the answer to personalized and dishwasher safe mugs! 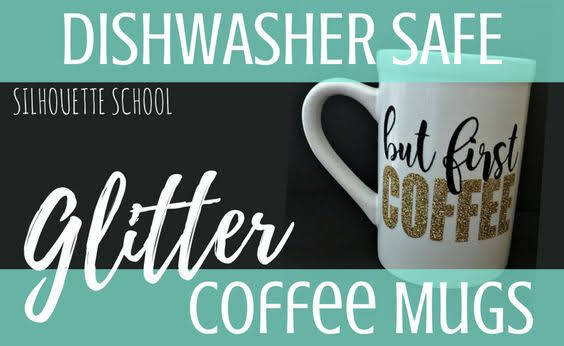 Not only are they super easy, but they save you the mess of using actual glitter for mugs. 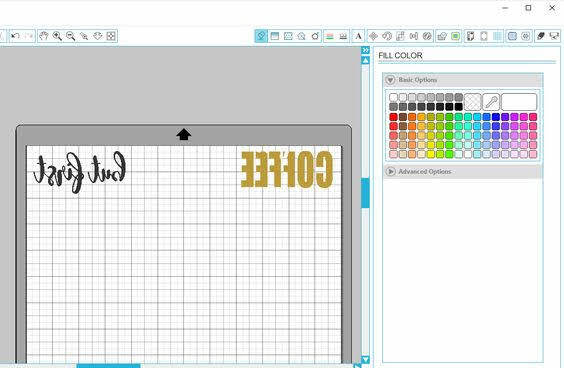 To start out, go ahead and set up your design in Silhouette Studio. Be sure to measure the cuttable area of your mug to make sure your design is sized appropriately. Don't forget to mirror your design, as it will still be applied in reverse. It's also important to note that we are going to cut glitter HTV, not smooth. Cut the HTV like normal with your Silhouette CAMEO and then weed it. Once your design is cut and weeded, line it up with your coffee mug to judge your placement. To apply the glitter htv to the mug, we used a household iron. I used my handy dandy Crafters Cradle to hold the mug in place while I worked. Since the HTV carrier sheet is sticky it's enough to hold the HTV to the mug. Using a household iron, and a thin fabric barrier, I applied heat to the mug and HTV. Remember, when using an iron, you want to make sure you turn the steam off and set the temperature to a cotton or linen setting (usually the highest temperature). As you apply heat to the HTV, keep your iron moving along the curved surface and apply even pressure (without cracking the mug). Since I used a two color design, I removed the first carrier sheet and then layered the second color and pressed again. I love my new coffee mug and I've been washing it in the dishwasher for about two weeks with no sign of wear or early peeling! Of course, dishwasher temperatures and settings will vary, but I believe you'll find this HTV trick is much more durable than regular adhesive vinyl on mugs. If you're interested in this simple but FREE cut file (of course), join us over at My Paper Craze and download a copy for yourself! This is WONDERFUL news! Thank you for sharing! Unfortunately, over at Paper Craze, the cut file is not easily found. Can you readjust the link? Thank you so much. It worked for me. It is right in the middle between two mug pictures. thanks for the file! umm... I'm new to the "Silhouette world" .... what's in November? I can't wait to try this. I love coming here to learn new things. I've been pressing the htv glitter vinyl on my mugs using my mug press. Works like a dream!!!! What is this mug press you speak of? I would have never known!! I love using HTV but I would have never thought about it for a mug!! Thanks!! Soooo ... I am guessing you can use regular HTV on mugs as well?? Mind. Blown. 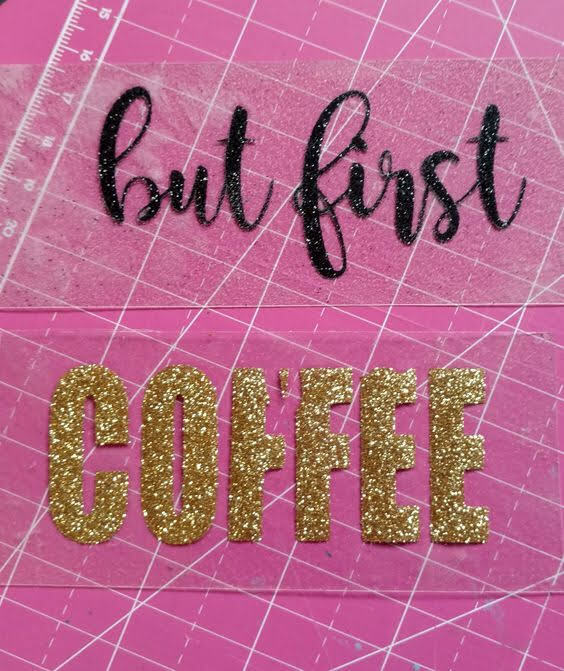 what is the font for but first? and can you use regular htv? Hello, I love this technique! Do you think it would work on the Yeti Metal tumblers as well? You mention that it is important that this is glitter HTV. Why does it need to be glitter? Where did you get your mug? I've been looking for ones similar.........!? could you do this on the yeti-type cups? Hello! How do you set the mug press? How much time and heat? And what kind of mug do you use? Cotton settings, you'll have to pay attention, lift up the fabric and check the vinyl. You don't want it to melt. It's a preference. When I use htv on wood, I iron it like you would iron clothing. I always keep checking the vinyl to see how well it adheres to the wood, or ceramic, after I'm finished and its cool. I'll go back and lightly iron it again. Just use your highest iron settings, no steam. I use glitter on my wood signs as well, I use either a regular iron or a small quilters iron. The quilters iron gets extremely hot, becareful!! So these heat settings are for ceramic only correct? Apply your vinyl motive to mug or glass (obviously make sure it is clean to ensure a good hold). Put the mug / glass on a rack into a cold oven. Heat oven to 150-175° C / 300-350 F and leave it in for an hour. Let object cool in the oven after turning oven off. The mugs I have done this with have withstood the dishwasher without ill effect for a good long time now. Would this method work with Oracal 631 or 651? Or does it only work with 751 C? 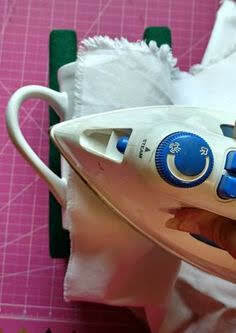 Could you use a heat gun instead of an iron? I tried it on my stainless cola shaped water bottle(with a painted surface) and it came out great. I even did some layering. I used regular HTV and metallic HTV. I suppose it would work on anything that the iron wont melt. Look out world here I come with HTV in one hand and an iron in the other. This is great news. I had thought only sublimation would work on ceramic. Thanks! I tried regular (non-glitter) HTV on a glass pint glass using an iron just like the tutorial above, but it didn't work. Melted on there fine (I checked around all the edges with my nail), but when I tried to wash it, it all peeled off. Definitely not dishwasher proof! Everything had a sort of halo to it before I washed it too. I tried and tried and the HTV would NOT adhere to a ceramic mug. Did you prep the mug first? I was using a heat press but it was not sticking AT ALL! So disappointed, I wanted a mug like the one in the tutorial. Ugh! I have tried this several times w/ 3 different brands of glitter htv. Each time the htv goes on just as it should, but once it cools something as simple as a gentle rub causes letters to come off. Does the surface need to be prepped a certain way? Please help. I followed this tutorial and they letters rubbed right off with a gentle hand washing.....suggestions? Can you use any HTV or only glitter. A few months have gone by since this post so how about an update on how it's holding up in the dishwasher please. Thanks for sharing this great technique. I tried this at home and amazingly it really worked!! Hi, It's amazing project, I can't fine glitter HTV here in Mexico, can I use the same vinyl to the Tshirt? I have tried and tried this. The htv peels right off. Using alcohol to clean the mug, tried several kinds of htv, used my household iron, used my craft iron. Pressed and pressed and pressed. Worked at it for a long time. Looks like it was adhered well. Removed the carrier sheet after about 30 seconds. Once it got cool, it peeled right off. Any suggestions?? ?